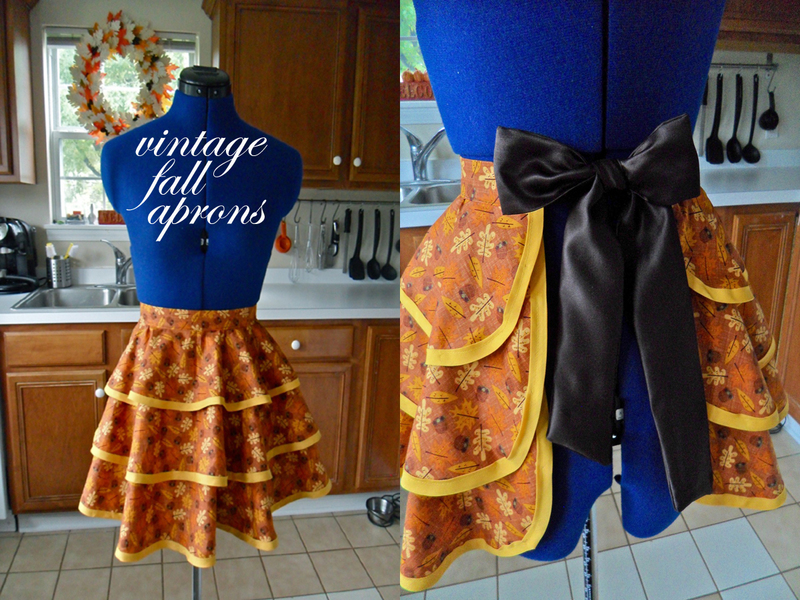 I love the look of vintage aprons and I always used to buy that style before I started sewing. Now that I make my own, I’m always on the hunt for a really great pattern and this one is my favorite. It’s a vintage pattern, Simplicity 2592, that the company re-released from their vault and I am in love with it! It’s so simple (I do make a couple changes to the apron, which i will make a note of at the bottom) and it’s fun to play around with different fabrics, color combinations and prints. These make awesome gifts and you’ll have fun picking out fabrics that match the person you’re making them for’s style! The pattern comes with 4 different variations, I made apron D and that’s what this post will show. I find it easiest to get everything prepped before starting. I cut out the pattern and fold on the size line I need rather than cutting them. This way if I need to use the pattern again and make it in a bigger size, I still can. 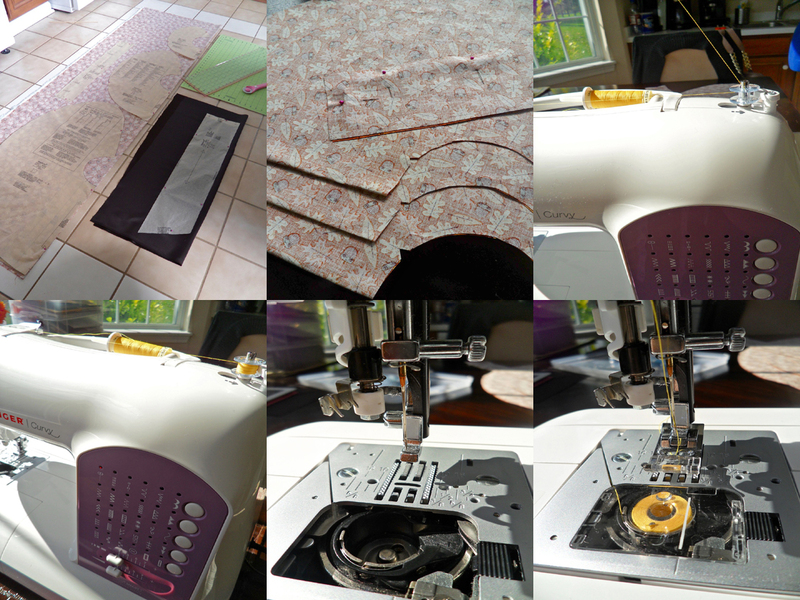 Iron the pattern pieces and your fabric. Fold the fabric in half lengthwise with the right sides together and, per the instructions, pin the pattern to the fabric. Cut out the pieces, cut notches where marked and use pins to mark where the dots in the pattern should be. Pick your thread color and wind a bobbin in that color. Change out your needle for a new one and thread your machine. Next, follow the instructions included with the pattern (Each step will match up with the pictures above, but note that I made changes to steps 4-7): 1. Encase unnotched edge of each apron section in double fold bias tape. (On the biggest section you will run out, just add a piece leftover from one of the shorter ones). 2. Pin wrong side of middle front and back to right side of lower front and back, matching centers front. Pin wrong side of upper front and back to right side of middle front and back, matching centers front. Machine-stitch notched edges together through all thicknesses. 3.Press under 5/8″ on unnotched egde of waistband, trim to 1/4″. Pin wrong side of apron to right side of band, matching centers front and placing back edges on small dots. Stitch and trim seam. 4. Press under hem allowance on long edges and end of the tie end without small and large dots. Open out pointed corner. Turn under corner diagonally where crease lines cross, trim to 1/4″. To form a narrow hem, tuck under raw edge to meet crease. Press. Stitch hem in place. 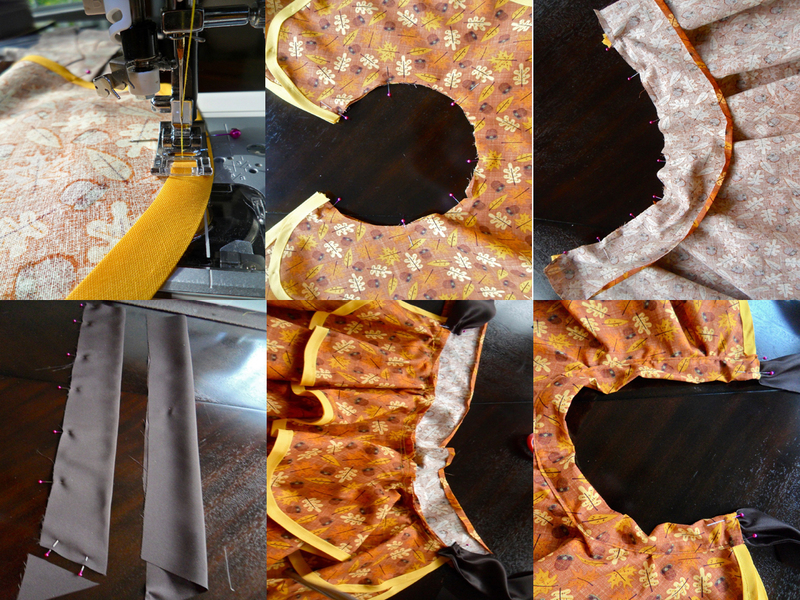 To gather remaining end of the tie end, stitch along seam line and 1/4″ inside seam line, using long machine stitch. 5. Pin wring side of tie end to right side of waistband, matching small and large dots. Pull up gathering stitches to fit, baste. 6. Fold waistband in half, lengthwise, with right sides together, matching small dots. Stitch ends and trim seams. 7. Turn band to outside. Pin pressed edge of band over seam, stitch band closed to pressed edge. ** Changes I made: Step 4: I didn’t like the unfinished look of the ties (you can see the seams and wrong sides once finished) so I did them differently. Since you end up cutting 2 of each piece anyways, I simply fold each piece in half with right sides together and sew the long side and the angled end together. You have to cut the extra triangle of fabric to make them line up, but that’s the only difference. One they’re stitched, flip them right side out and press. Gather the same way as the other ties. Step 5-7: I think they make this more complicated than it needs to be. I just pul the gathering strings on the ties until they’re half the width of the band, fold the band over the wrong side of the band and the ties and stitch it. The I go back in and hand stitch a hem where the band ends and the ties begin. For the apron pictured above I used a harvest patterned fabric from Joann Fabrics, Gutermann Color 855 thread, Wright’s Extra Wide Double Fold bias tape in Marigold (206 1246) and I used a chocolate brown satin for the ties. I’ve been playing around making a few of these with different patterns and additions, like the one shown at the bottom. Adding a line of jumbo sized rick rack to the waistband gave it an even more retro feel, which I really liked. 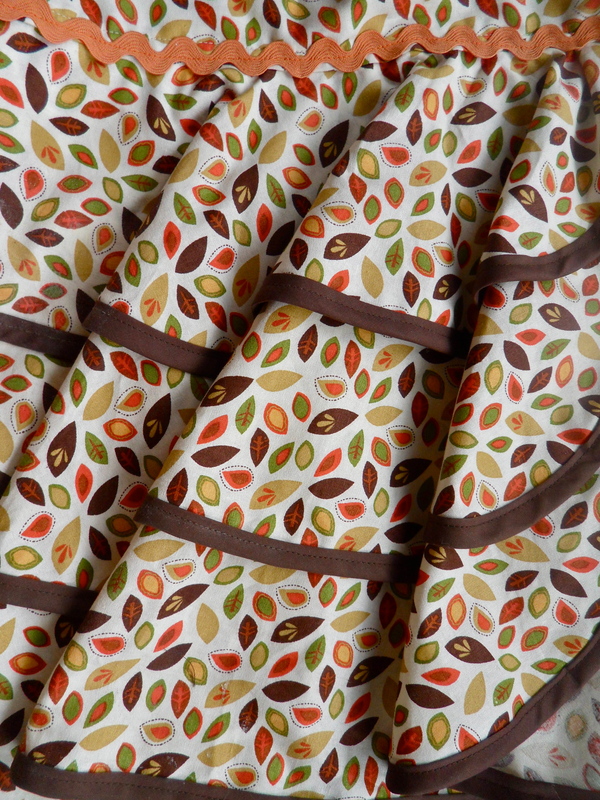 For this apron I used another Harvest Fabric from Joann’s, Gutermann Color 596 Thread, Wright’s Extra Wide Double Fold bias tape in Mocha, a green cotton for the ties, and Wright’s Jumbo rick rack for the waistband in Carrot (402 1241). If you don’t sew or simply don’t have the time to make one yourself, I have a few for sale in the Etsy Shop! love love love the pattern! Ok, so when I made this pattern, the thing that got me is that one side is rounded and the other was very angled. I think I missed something because when I put it all together, I ended up with just that. A round left side and an angled right side. It didn’t look bad, but it did look asymmetrical. What did you do to get yours rounded on both sides. Thanks for the tutorial, as well! I was totally stuck at the waistband when I found your site! This may sound silly but when you cut the original pattern, did you do so on a fold? The pattern pieces are for half of the skirt, then when you cut it on a fold and open it up there are two curved sides for each tier. That’s the only reason I can think of, please let me know if that helps! Lol! Not silly at all. This was my first pattern, and I totally missed that. It explains so much, like why the waistband was so much larger, etc. haha. No problem, happy we could get to the bottom of it! Lol I learned the same lesson trying out my first pattern so you’re in good company! You’re so right that it’s a learning experience, every pattern you try you learn so something new the hard way but it does pay off in the end!